Our schedule is rigorous: training six days a week for six weeks. It's rewarding, transforming, and intense. A foundation of the curriculum is voice and text—you'll explore the relationship between clear, expressive use of Shakespeare's language, and the imaginative and emotional possibilities of the worlds created in his plays. The other foundation is ensemble collaboration, building a close-knit, dynamic company to serve in the process of bringing Shakespeare's stories to life. Masterclass teachers and professional artists also visit us throughout the summer, to offer specialized instruction in their areas of expertise. Our masterclass instructors are exemplary leaders in their field, joining us in Stratford from institutions such as the Juilliard School, the Yale School of Drama, and NYU Tisch/Grad Acting. Past masterclasses have included voice, speech, Alexander Technique, clown, stage combat, Droznin Method, Lucid Body, and others. Our course of study is a contemporary take on the young-actor training program that once occupied our home on the grounds of the former American Shakespeare Festival Theater. 2016 Ensemble traveling together to visit Shakespeare in the Park in New York City. Living together in our coastal Connecticut hometown, Stratford, is a cornerstone of the experience—the ensemble shares two houses, both walking distance from the Academy. Together you'll walk to class, take trips to the grocery store, and prepare meals. (Mike Shepherd of the UK's Kneehigh Theatre calls cooking together "a quickfire way of creating an ensemble," a philosophy we share!) Because friendship is a big part of what happens here, SA@S students end up spending time outside the Academy too—making trips to the beach together, biking, and exploring the surrounding area, including New York City, on their days off. The Rooney family of the Mighty Quinn Foundation, who host many of our students in their home each year, also plan weekly communal meals for the Academy, including cook-outs, bonfire nights, and picnics. In past years we've watched the fireworks on the 4th of July, joined in the annual Mighty Quinn Foundation Cook-Off on the theater lawn, and made trips together to New York's Shakespeare in the Park and the Hudson Valley Shakespeare Festival. Putting training into practice, the company rehearses and performs two plays in rotating repertory. In 2019, Artistic Director Sara Holdren will direct The Winter’s Tale, and visiting director Benjamin Curns will direct Coriolanus. At the conclusion of the program, both plays are performed in repertory in a ten-day festival for the local community, family, and friends. Every member of the ensemble acts in both plays. (We also offer one assistant director position for each play, in lieu of an acting role.) Roles are balanced between the two productions—for example, in 2014, Ophelia in Hamlet also played the smaller role of Caius Lucius in Cymbeline. We will rehearse both plays simultaneously. Expect to be involved in every rehearsal. In other words, we're going to be busy. 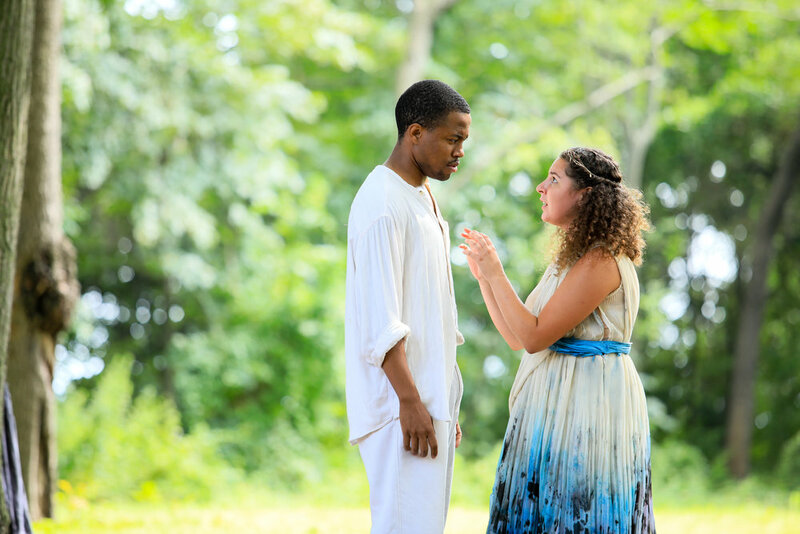 You will be encouraged to think about performance beyond the traditional stage, working site-specifically on the grounds of the former American Shakespeare Festival Theater, our home base in Stratford. In the spirit of making theater as an ensemble, you will also be involved in other areas of production: choreography, writing music, building sets, wardrobe, technical support, whatever our production needs. Stratford has a remarkable, rich history of producing Shakespeare's work. By performing here, you'll be part of a long tradition. Our home on the grounds of the legendary former American Shakespeare Festival Theater was, until its closing in 1989, host to numerous great actors over the course of several decades—including Katherine Hepburn, James Earl Jones, Paul Newman, Christopher Plummer, and others. Our home base in the historic Nicoll-Benjamin House on Elm Street (better known in Stratford as the "White House") was once home to the American Shakespeare Academy, a renowned young-actor training program. The ensemble, program staff, and Alumni Company come together weekly for celebratory Friday Night Showings. These are an opportunity to relax, perform, and share in each other's creative work—not only in theater but in music, standup, sketch comedy, writing, and more. What you share will depend on what you've been working on, whether on your own or with others in the company. Our Friday nights grow the ensemble dynamic, influence our productions, and give us the chance to celebrate each other's company and our work together. In weeks 3 & 4, we also invite the public to join us for Friday Night Showings. "There's no 'typical' day in Stratford," says Shana Laski, who was part of the 2017 Ensemble. "The daily schedule is a rotation of incredible masterclasses, rehearsals, and fun group activities that helped us bond—building a strong, skilled, cohesive ensemble. "For example," she says, "We might begin with an hour of yoga, waking up our muscles and prepping our bodies for a full day of training. Next we'd take an intensive masterclass in movement, such as Droznin with Rachel Jett or Lucid Body with Fay Simpson, where we learned to be more aware of our bodies in space, and how physicality affects performance. Or we might take a voice masterclass with Ron Carlos, learning to preserve our voices during the intense process of rehearsing and performing two Shakespeare productions site-specifically. Or we might take a masterclass in clowning. Or stage combat. Or Alexander Technique. The schedule is ever changing, and the learning is relentless. "After a break for lunch might be another masterclass, or else we'd head into rehearsal for one of the summer's two productions. Rehearsals offered as deep an education in Shakespeare performance as the masterclasses did. Here, we not only prepared for our productions but also studied Shakespeare's text… learning how to analyze it, interpret it, free it from the page, and live it in our bodies. It was amazing to witness how everything we learned in masterclasses and rehearsals began to translate into discovery of character and a deep understanding of the plays. "Our evenings were devoted to any number of activities. Most often we would head to rehearsal for our second repertory production. Other times we would share one of our biweekly communal meals with the lovely Rooney family. We might see a performance in New York City, or locally at the high school theater camp. We might share our creative work at Friday Night Showings. We might have some downtime to spend around the piano in the Main Street House, or play Koosh in the backyard, or have a bonfire. No matter the activities of the day, everything was designed to bring us together as an ensemble, through learning, play, and Shakespeare. The end result is a fourteen-person, talent-packed family, putting on two unbelievable shows."